Been there - done that - I've had this message for a day or two now; also with some observations where the map was loading correctly - so suppose that the software folk are still busy with it. As before, I just wait and see if it's the same as the building of Rome. Patel, Hotel Manager "The Best Exotic Marigold Hotel” - works for me. Looks like @Amadan's gremlins have naturalised and are now breeding in the ISpot computer.....maybe they'll die out when it gets cooler? Consolation? 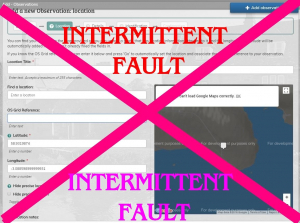 @miked Google maps are not working across the web in certain places. Google changed their pricing model, it seems, so very many websites are having problems as google cut them off or limit the usage. I have noticed on other websites myself. Several years ago I predicted this would happen, at some stage in the future, but no one wanted to listen and refused to make sites robust and able to use multiple map sources. Maps are failing on iSpot again. Why is it not as simple to fix as paying Google more money? This is intermittent, so probably has nothing to do with Payment, unless it's paid daily, hourly even. Paid by whom? From what budget? OTOH it doesn't seem unreasonable for anyone providing a resource to expect some payment from - large - users. Free lunches come to mind. In general terms it is a simple fix to pay Google more but it is rather a lot more since they have increased their prices by a huge amount, some people on web suggest it is a 15x increase in prices. Perhaps a bigger issue is that it is so difficult to contact the right people in Google to discuss all the issues and ensure that the pricing structure is appropriate, this may be why so many websites that use maps have vanished or not been able to function properly anymore. It is still affecting many of the websites I use and I suspect they may have to close down or loose a large part of their functionality. How many maps a month does iSpot require? Edit: It looks like they've reduced the free credit roughly 30-fold. (I would have guestimated that iSpot was within the old free credit limits). 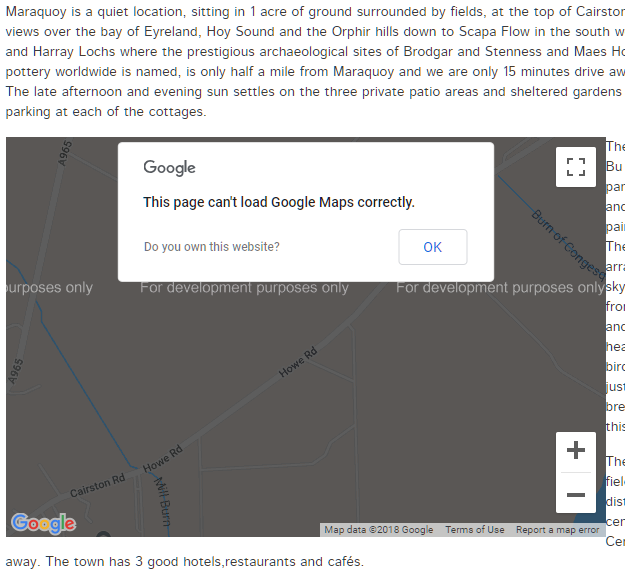 If you do not require your Maps to be customised in any way and are happy with the way that the standard Google Maps works and looks, then you can simply find a location for your Map on Google Maps and embed it onto your page(s). This way you will not be charged as embed requests have unlimited usage under the new Google Maps Pricing. Edit: But perhaps an embedded map is insufficient (for adding observations) as perhaps it doesn't allow you to get a location back from it. That isn't required for people who specify location by GR/lat+lon, and for people who specify locations by name an alternative location service could be used while still displaying Google maps. The old feature whereby iSpot remembered locations would have helped here. A little more investigation finds that the Google Embedded Maps API is now split into basic and advanced, with basic still being free. Basic includes Place mode and View mode. Place mode seems to what is needed to serve up a map for a view of an observation with a pinned location - but not one with a monad or hectad square. EasyGPS went through a period of not displaying pins, so I went and had a look at how it implemented its maps, but it turns out that it's currently using Microsoft Maps, and has 4 API calls to implement it - one to create the map and 3 to add the pin. I suppose the next thing for me to do is to look at how iSpot implements its maps. Edit: the implementation of maps seems to be hidden behind includes. But when looking at the source to the map view of my observations I noticed HTML for a list of links (not displayed) to the observations from the main carousel. I don't suppose it's significant, but it won't help performance. Without the link to Satellite view iSpot would be much poorer but I could live without it and, of course, Street View too but which is terribly undervalued here.